The 1970s was a confused time to love in America. Between swingers' parties, consciousness-raising circles, and the Pill, there were a lot of new possibilities. Luckily, writes historian Judy Kutulas, people had skilled guides to the new world of relationships: women singer-songwriters like Carole King, Joni Mitchell, and Carly Simon. After a decade of political and social upheaval, people turned inward and tried to incorporate those radical changes into their relationships. For many, writes Kutulas, the music of singer-songwriters was a way to imagine more modern ideals of romance and sexual relationships. Just a decade before, the road to relationship had been clearly defined - dating, love, marriage. But in the 1970s, that fell apart as the first pioneers of the sexual revolution challenged rigid social mores and the social norms of everyone around them. But singer-songwriters like Carole King, Joni Mitchell, and Carly Simon sang songs that expressed a wide range of relationship possibilities, from sexual release to ambiguity about love and marriage. “The first beneficiaries of the women's movement...purchased female singer-songwriter music because it offered them an authentic female voice and ‘an alternative to the romance script,'” Kutulas writes. By embodying the socially acceptable forms of feminism, still appealing to men, King, Mitchell, and Simon modeled a safe, yet socially progressive ideal for young women. This voice moaned, demanded her own pleasure, began and ended relationships. It told men they were so vain, they probably thought this song was about them, called them “mean old daddies,” and proclaimed that the earth had moved under their feet. At a time when the meaning of the term “relationship” was shifting, singer-songwriters helped express the potential. None of these singer-songwriters was socially radical; all three sang about heterosexual love and none overtly embraced women's liberation. That was part of their appeal, writes Kutulas. By embodying the socially acceptable forms of feminism, still appealing to men, King, Mitchell, and Simon modeled a safe, yet socially progressive ideal for young women. Not everyone loved their music or their style, and all three women were continually sexualized, criticized, and downplayed by men in and out of the rock establishment. Though there were popular male singer-songwriters like James Taylor, they often incorporated messages of wanderlust, aggressive sexuality, and drug use in their songs in an attempt to prove their masculinity. There was a downside to this dichotomy, writes Kutulas: It suggested that maintaining relationships was women's domain. Though they demanded equality and maintained their self-esteem when their relationships ended, women were expected to do the emotional labor while men wandered. 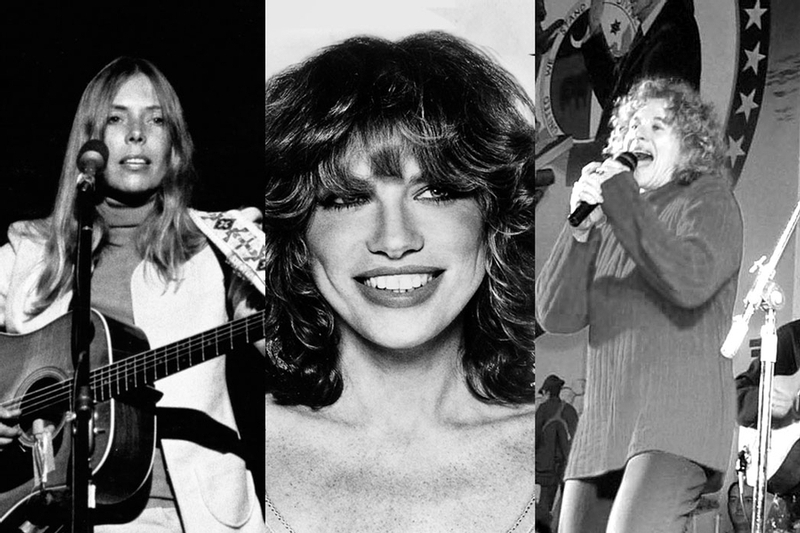 Eventually these female singer-songwriters fell out of style, and society moved on to disco… and divorce. This article has been viewed 868 times since being added on May 15, 2018.